I know you hate spam. We all hate spam. And I am not talking about the kind that Monty Python talk about - that kind of spam is funny. We have all had the Nigerian prince emails or, more recently, the $2,000,000 bitcoin windfall emails. If you are like me, you spend time reading the email and then realise it is spam, then delete it. Fully expecting that you will do the same thing again tomorrow. Spammers are often cowardly internet fiends who prey on people for a business. Most of us are aware that these emails are scams and give the email their due. By deleting them. But there are people, friends and family who are not as aware and can be caught by these schemes. Even if you do recognise the scam for what it is, you still have to spend time scanning the email before you realise it is not legitimate. 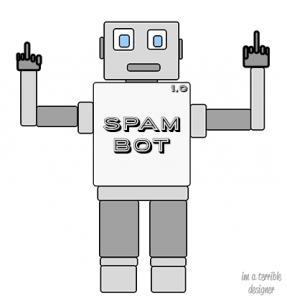 Brian Weinreich has created a way that we can get back at spammers. Spammers waste our time with their useless emails, so why not pay them back. All you have to do is forward your spam email to [email protected] and then the magic happens. MLooper is a bot which you can use which sends the spammer emails on your behalf and tie them up with meaningless and time-consuming email threads. All you have to do is forward your spam email to [email protected] and then the magic happens. The MLooper service will reply to the spammer on your behalf (redacting your personal information) and involve the spammer in a meaningless loop email conversation. See here for some more details. It is a brilliant idea. Please share this with your friends and family and let's get back at the spammers. It probably won't stop spam, but hopefully it will reduce the amount of time we spend wading through spam emails.